The resolution test (resolution meaning here MTF50 function values) of the Olympus M. Zuiko Digital ED 17 mm f/1.2 PRO was based on RAW files from the Olympus O-MD E-M5 Mark II. In this case the decency level is situated near 48-50 lpmm and high quality fixed focal length lenses can reach as high as 85 lpmm or more. The best performance so far has belonged to the Panasonic Leica DG Elmarit 200 mm f/2.8 POWER O.I.S. which exceeded 91 lpmm, and the Olympus M.Zuiko Digital ED 45 mm f/1.2 PRO which managed to get near 96 lpmm. 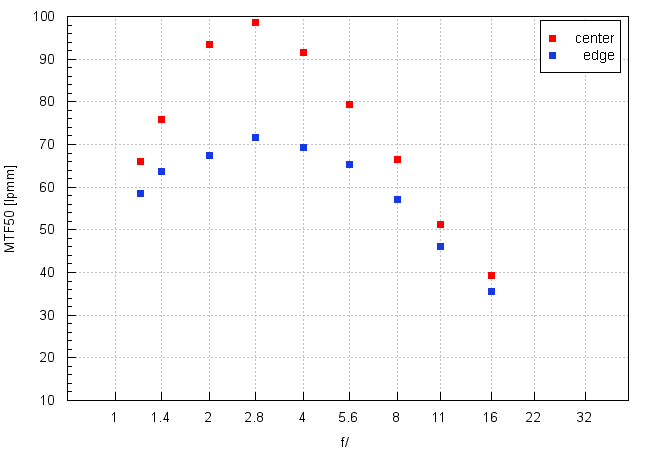 Now let’s check how the tested lens compares; a graph below presents its results in the frame centre and on its edge. You can notice at once a new record value. The Olympus M.Zuiko Digital ED 17 mm f/1.2 PRO is better than the 1.2/45 model not only at the maximum relative aperture but also on stopping down, as it is able to reach 98.6 ±0.9 lpmm, setting a new resolution record for the sensor of the Olympus O-MD E-M5 Mark II. When it comes to the edge of the frame you can describe it in superlatives only. Already from the maximum relative aperture you see results soaring near 60 lpmm so making images fully useful. On stopping down the aperture, in the f/2.0–5.6 range, resolution values exceed 65 lpmm and by f/2.8 they almost reach 72 lpmm. It means images are sharp across the frame. Of course you should remember that wide angle constructions are more difficult to correct, especially when a lens comes with such a good aperture fastness. The 1.2/45 model, with the angle of view two times smaller, was able to provide values over 80 lpmm on the same sensor. The summary of this chapter can be only positive. You deal here with a wide angle lens with an angle of view of 65 degrees and an excellent aperture fastness, that of f/1.2, which in the frame centre breaks resolution records and provides images of good quality on the edge of the frame already up from the maximum relative aperture. Such a performance is required from top-of-the-range lenses, available on the market and we must say the tested Olympus has no problem with meeting those requirements. At the end of this chapter, traditionally, we present crops taken from photos of our resolution testing charts; these were saved as JPEG files along RAW files we used for the analysis above.